Through our web hosting division, the Lounge Network, Design Lounge offers Premium Quality Business Grade NZ Web Hosting on New Zealand located web host servers. With the servers being based in New Zealand, it means ultra fast web page loading, and server reliability that is second to none. We have now been providing web hosting services since 2001 making us one of New Zealand’s longest serving web hosting providers. Best of all, you don’t need to be one of our Web Design clients to sign up, we allow any business to host their website on our network. We also offer premium quality website hosting on US based web servers, for users who have large disk space requirements, high bandwidth/traffic needs, or who require a lower cost hosting solution. Our servers support PHP and MYSQL and allow full management via a NZ developed control panel. Our Premium Business Hosting Plan is High End Premium Quality Hosting, housed on a Genuine New Zealand Based Server Network. 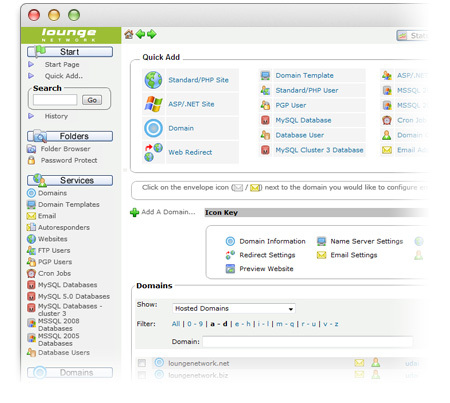 Visit our Lounge Network website for full information about our web hosting. Click the button below to sign up to our Premium Business Grade Hosting today.